Of his wishes, which were certainly supported by broad circles of the population, but in the following years, only the establishment of the war memorial came true. At the foot of the Tyssa walls, a worthy war memorial was erected in honor of the Tyssa soldiers who died in the First World War . On a metal plaque, the names of the 70 killed are recorded in honor and the monument and its surroundings were lovingly cared for. At the time it was hoped that such a war with unfortunate victims would never happen again. However, history taught us another! With the outbreak of World War II, the war memorial unfortunately had to serve as a place of “honorable commemoration” for the fallen sons of the place . 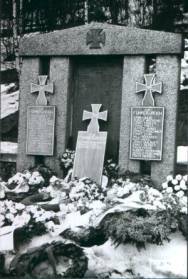 With a wooden plaque of honor, crowned with the Iron Cross and inscribed “Für Führer und Reich” the name of the first fallen soldier ” Franz Freier ” was registered in 1939. In the course of the war, the entries filled. My brother, Gerdi Richter , who fell in front of Moscow in November 1942 at the age of 20, was already the 14th victim. On my photo from 1944 names of 33 fallen soldiers were already registered, the last of them ” Richard Austen “. I am sure that by the end of the war, it is far from the last victim. I remember well that in honor of the fallen soldiers and as a sign of mourning against the church in a showcase the image of the soldier was to be seen with a worthy text and in the cinema a public funeral was held. What did the unfortunate war bring with it for suffering and misery ? The soldiers who remained in the war gave their most valuable, their lives and their families not only lost a loved one, but also their home. Anyone visiting the war memorial in Tyssa only recognizes it by its stoppage . The metal plates have disappeared. And where used to be cultivated and thriving environment, weeds and wild growth has covered everything. So only the memory remains!